María Fernanda Espinosa Garcés, then President-elect of the 73rd session of the General Assembly addresses the media at UN headquarters in New York. June 2018. In addition to serving as the Minister of Foreign Affairs and Human Mobility, Ms. Espinosa has also been the Minister of Defence and Coordinating Minister of Cultural and Natural Heritage of her country. She begins her duties in the Assembly’s top job, on Monday afternoon, when she takes the historic gavel from Miroslav Lajčák, the President of the 72nd session. Speaking at the UN Headquarters, in New York, after her election in June, she promised to lead the Assembly in a way that strengthens multilateralism and better delivers on its commitments. UN News spoke with Ms. Espinosa before taking office, and asked her what her priorities were for the 73rd session. Ms. Espinosa: I think that we are really living in a very troubled environment, and I think it is very important that we really work towards the strengthening of the multilateral system and the revitalization of the United Nations; that we work hard to deliver better. The D.A.R.E acronym is going to guide my work as President of the General Assembly during the 73rd session. So, revitalize and boost multilateralism, revitalize the General Assembly, revitalize the UN system. I think that we all need, and we will all benefit from, a strong rules-based international system. María Fernanda Espinosa Garcés, then Minister of National Defense of Ecuador, speaks at a General Assembly debate on ensuring peaceful and sustainable societies in April, 2014. UN News: You have spoken of seven priorities for your Presidency, can you tell us about them? Why did you choose seven? Ms. Espinosa: After talking with Member States and looking at the 40 mandates and over 15 high-level events and conferences over the course of the session, we have come up with seven priorities. Why seven? Why this magical number? Because we need to deliver seven days a week, we need to work for the disenfranchised, for the poor, for the refugees, seven days a week. Climate change doesn’t stop on Fridays. We will work as needed to deliver on the seven priorities. One is on gender equality. I am only the fourth woman and the first Latin American woman having the privilege and the honour to preside over the General Assembly. Gender equality, empower women in politics, empower women as architects of the implementation of the 2030 Agenda for Sustainable Development is going to be on top of my priorities. We will be working on migration and refugees, taking up this very important momentum of the adoption of the Global Compact on Migration. After the summit in Marrakech in December, we will be working on the right of people, the human mobility of people, and working hard on implementing the Global Compact. The third priority is going to be on environment, with two areas of work basically: the assessment of the three years after the Paris Agreement [on climate change], especially looking at the means of implementation, meaning climate finance, low-carbon technologies and capacity building. We will also really push for a campaign to avoid plastics. A ban on plastics is something that we think that the General Assembly has a very important role to play on environmental action. We will be working for the rights of persons with disabilities. This is also going to be among the seven priorities. Both to universalize the Convention [on …]. We are very close to this landmark. We are almost there. We will work to have all Member States to sign the Convention and to commit to the rights of persons with disabilities. Alongside, we will also work on accessibility and on issues of access to decent work for persons with disabilities. We will have a priority on peace and security, of course. Peace and security, but with a focus on the preventive approach, the sustaining peace approach, and focusing on the role of youth. Youth as actors of building a more peaceful and more secure world for all. This is also going to be connected to one of the main deterrent strategies, which is to provide the youth with alternatives, to provide them with job opportunities, to avoid them entering into violent extremism activities, for example. I also mentioned the priority on revitalization of the UN. We will work on boosting the activities of the General Assembly to work, because it is on the table, it is a mandate on Security Council reform, but also, on the implementation of the reform that has been negotiated for a full year by Member States. The three pillars of the reform: the management reform, the peace and security reform, and also, the new development system. This is also going to be a major challenge among our priorities. [This year] decent work and economic growth, is among the six SDGs that are going to be assessed this year during the High-Level Political Forum on Sustainable Development. So, we will focus our work also around access to decent work. We will be teaming up with ILO. ILO is celebrating its centenary this year, we will be working strongly on decent work and economic growth, as well. UN News: These are all very important matters, but if you must choose one – one that people will remember about you. What do you think will be the pillar of your presidency? Ms. Espinosa: I think that perhaps three key words: the “D.A.R.E” acronym: Delivery, Accountability, Relevance and Efficiency. I think that this is about housekeeping and improving the way we deliver to the world. That is one thing. And perhaps the second thing: the “lema” for this session – the theme for this session – is making the United Nations relevant to all people. Bringing UN closer to the people and the people closer to the UN – bringing a people-centred approach to our work. UN News: How does it feel to be the first Latin American women to be the President of the General Assembly? Ms. Espinosa: I think it is both an honour and a great challenge. Us women, when we are in positions of power or positions with high responsibilities, we have to deliver doubly. I think that in a world that is still a male-driven world, it is a huge challenge because you have to prove the world that you are able, that you can deliver, that you can do things equally, you know, in a good way. So, you have to be efficient, you have to prove yourself, and you have to also represent women from around the world, not only Latin American and Caribbean women, but women that are suffering for one reason or another because of discrimination, because they are victims of conflict, women and girls, because they cannot fulfil their dreams, because they live in contexts or situations that are violent and that really threaten their rights as human beings. There is a lot to do, and I am extremely proud to be the first woman, Latin American Caribbean woman, to have the privilege to lead the General Assembly. 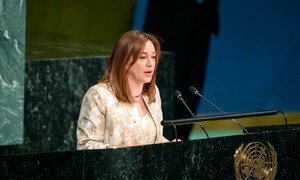 María Fernanda Espinosa Garces is only the fourth woman in the 73-year history of the United Nations has been elected as President of the General Assembly, the UN’s main deliberative and policy-making body. She is the Foreign Minister of Ecuador. UN News: After you were elected, you vowed to keep an “open-door” policy during your presidency and act as an impartial, objective and open facilitator. Why is this important for the Assembly President? Ms. Espinosa: Well, I think the role of the President of the General Assembly has evolved. In the 1980s and the 1990s, it was more a protocol position: a nation’s President would come to New York and preside over the Assembly during its high-level segment, from September to December. But now it is a political position of high responsibility, to really lead the works of the General Assembly during the full year. The agenda is full for the year. It is not only to lead, but also to be a bridge for consensus, a dialogue-creator, an honest broker to really have Member States to take decisions in favour of delivery on the three pillars of the Organization and the UN Charter: the peace and security pillar, the development pillar, and the human rights pillar. We have a wonderful umbrella now – the 2030 Agenda and the Sustainable Development Goals (SDGs). We also have 40 mandates for the General Assembly this year, the President has to show leadership to create spaces for dialogue and agreement, to push for consensus, and to push the Member States, a little bit, so they can agree on things that are very important for the world today. UN News: You spoke about the Global Compact on Migration. What are your expectations for the finalization of the Global Compact? Ms. Espinosa: Well, I think we are very much looking forward for the summit that is going to take place in Marrakech, in December. The idea is that as many heads of state and government will come and meet at the highest political level, and then we have homework to do. The homework to do is to really build the path for implementation, for assessment, and make the Global Compact a tool for the development of proper national policy, for political commitments, and it is going to be a very powerful umbrella to guide and norm global and world migration. There are lots of expectations, and really looking very much forward to see as many heads of state and government as we can. This has to have a very strong political push.